Robert Cheek, son of Richard CHEEK, Sr., & Jane RANDLE(? ), was probably born abt. 1730 in Virginia or North Carolina and died abt. 1800-1801 in Moore Co., NC. The name of his wife is unknown. Richard Cheek, b. 1755-1760; d. 1836-1837, Moore Co., NC. Richard appears in the Moore Co., NC, census 1800-1830. Identified as an heir of Robert CHEEK in two deeds from 1805. (Chatham Co., NC, DB O, pp.229-231, 342-344.) He might be the Richard CHEEK "of Moore County" who, with William DUNN, sold 100 acres on Drowning Creek to Kenneth CLARK on Mar. 9, 1804. Drowning Creek is located on the border of Montgomery & Moore Counties. (Montgomery Deeds 1798-1807, p.343.) He might be the Richard CHEEK who was granted 400 acres south of Deep River on the drains of Persimmon Glade on Nov. 11, 1807 (Grant No. 1941) & 22 acres on the south side of Deep River Dec. 21, 1816 (Grant No. 2257). 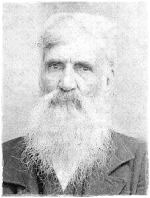 He is probably the Richard Cheek of Moore Co., NC, who gave an affidavit in support of James HARDIN's application for a Rev. War Pension; in the affidavit, dated Sept. 1, 1832, he testifies that he served with James HARDIN under Capt. William GOLDSTON for a five month tour of duty. (NARA Pension File No. R4592). Richard's will dated Dec. 5, 1836, proved Feb. 1837, names children Sarah J. WILLIAMS, Marthy, Elizabeth, John, Richard, Silas, Nancy, Josiah, and heirs of son William; land on south side Deep Creek. (Moore Co., NC, WB B, pp.103, 105-106). Executor: "relation and friend" William DAVIS. Signed: Richard (X) CHEEK, his mark. Wits: Corns DOWD, Archibald SHIELDS. Note: Richard may bethe father of Richard CHEEK (c.1798) and Silas CHEEK (c.1800) who moved to Tishomingo Co., MS.
James Cheek, b. 1760-1765; d. aft. 1830. James appears on the 1815 land tax list of Moore Co., NC, and the census 1800, 1810, 1830, and possibly 1840 (first name partially obscured; age 80-89). Identified as an heir of Robert CHEEK in an 1805 deed. (Chatham Co., NC, DB O, pp.229-231.) Possibly the James CHEEK who obtained a land grant for 50 acres north of Deep River, Dec. 24, 1814. (Grant No. 2199.) No children have been identified, but census records suggest he had several children: 3 sons & 2 daughters born between 1800-1810, 2 or 3 sons born between 1810-1820, and 1 daughter born between 1810-1820. Olive Cheek, identified as an heir of Robert CHEEK in two deeds from 1805. (Chatham Co., NC, DB O, pp.229-231, 342-344.) No other info. Robert Cheek was under 14 when his father's will was written in 1743. He must have been of legal age, however, by the time he appears on a tax list in Granville Co., NC, in 1749. Therefore, he was probably born around 1730, give or take a couple of years. Robert lived in Granville Co., NC, until 1754. In 1756, he purchased 150 acres in Cumberland County on the north side of the Deep River from his brother-in-law, Cornelius Tyson. From other records, it appears this land was located near the border of what was then Cumberland and Orange Counties, but later became the border of Moore and Chatham Counties. Robert continued to own land in Granville County until 1761 when he sold out to his brother William Cheek. Somewhat confusingly, records of Robert's presence can be found at various times in Granville, Cumberland, Orange, Chatham, and Moore Counties, although he probably only lived in two different places: first on Fishing Creek in Granville County, then on the Deep River near the Cumberland/Orange (now Moore/Chatham) County line. Many of the records of Moore County, NC, were destroyed in a courthouse fire in 1889, including deed books, marriage books, and loose estate papers. This obviously complicates genealogical research. In particular, there has been some confusion between the children of Robert Cheek and his brother, Randolph Cheek, who also lived in Moore County. However, 7 of Robert Cheek's children are identified in two deeds from 1805 that were recorded in Chatham Co., NC (see below). The deeds imply there were actually 8 heirs, because Robert's land was divided into 8 parts, but only 7 heirs are identified by name. Be careful not to confuse Robert Cheek of Moore Co., NC, with his cousin Robert Cheek of Orange Co., NC. The two Roberts were about the same age and lived in some of the same places, but not at the same time. Robert "of Moore" was in Granville Co., NC, during the 1750's (where he had land on Fishing Creek), and settled in on the Deep River in Cumberland (now Moore) County in 1762. Robert "of Orange" was in Brunswick County, VA, in the 1750's; moved to Granville/Bute County in the 1760's (where he had land on Sandy Creek); and settled in the New Hope Creek area of Orange County in the 1770's. - Robert CHEEK, 1 tithe. June 4, 1752. Granville Co., NC. Richard CHEEK and Robert CHEEK are involved in a robbery prosecution against Peter COLLINS. Oct. 8, 1754. Granville Co., NC. William CHEEK & Robert CHEEK are listed in Capt. Sugan JONES Company of the Granville County Regiment. Oct. 23, 1756. Cumberland Co., NC. Robert CHEEK purchases 150 acres on the north side of the Deep River from Cornelius TISON. Wit: Randolph CHEEK, George HENDRY, Thomas COLLINS. Note: the Cane Creek Monthly Meeting is still an active Quaker congregation. The meeting house is located in the town of Snow Camp, now part of Alamance Co., NC. Oct. 17, 1761. Granville Co., NC. Robert CHEEK "of Orange County" conveys to William CHEEK of Granville Co., 212 acres on William CHEEK's corner, north side of Fishing Creek at Charles BARTHOLOMEW's line, for £10. Wit: Cornealus TISON, Randal CHEEK, Jeffrey HORTON. On the same date, Robert CHEEK obtains a land grant for another 212 acres on the north side of Fishing Creek. Note: Robert Cheek's land was located on Tysons Creek of the Deep River, near the border of Cumberland and Orange Counties. This is now the border of Moore and Chatham Counties. Tysons Creek flows south from Chatham County and enters the Deep River in Moore County at a large bend in the river near the present-day town of Glendon, about 2 miles south of the county line. View a Google map. 1767, Cumberland Co., NC. Robert CHEEK appears on a tax list. Note: Robert may have been expelled from the Quaker church because he fought in the Regulator Rebellion. - Robert CHEEK: 1,200 acres. - Randolph CHEEK: 836 acres. Note: The following deeds undoubtedly involve the same 241 acres on Tyson's Creek that Robert Cheek obtained by grant in 1762. The deeds were discovered in the records of Chatham Co., NC, by Melinda Matthis.